Retreat to our one bedroom country apartment with your loved one and spend some quality time together. Situated on a lovely country lane 2.5 Km from the lively market town of Órgiva, you are surrounded by green mountains Olive and Orange trees. Rural charm and modern comfort co-exist in this high quality accommodation. Relax thoroughly on the terrace and enjoy the birdsong , take a stroll along the lane to town, or get out and about to the Mediterranean beaches or the Alhambra palace at Granada. And don't forget to stargaze at night! We moved to Spain to bring our children up in a safe and friendly culture. Ralph is a successful sculptor and an ingenious practical fixer of anything from strimmers to computers. Mandy is an English teacher locally but has been both a psychiatric nurse and belly dancer. Flexibility is the key to life in the Alpujarras! We both speak good Spanish. Our rambling farmhouse is located in Tijola, 2.5 kilometres away from the lively mountain town of Orgiva. The abundance of flowers and woodland and its proximity to the river make Tijola the most desirable location in the area. The previous Spanish owner made wine in a "bodega" in an unused room next to the stables, treading the grapes with a new pair of wellies each year! Unable to continue the tradition ourselves, we converted the wine room into a smart and comfortable apartment for couples or solo travelers. The location is wonderful and in easy reach of Granada, the white mountain villages and the coast. As we avoid pesticides and maintain a variety of habitats on our land we have abundant and interesting bird life ranging from common British garden birds to more exotic species like Shrikes, Hoopoes and Golden oriels . Many guests love to cook using the fantastic fresh produce available locally. There's no scrabbling around for enough plates here. Nor will you be frustrated by the lack of a cheese grater or potato masher. Guests have repeatedly praised the kitchen. And there is a dishwasher. Of course, every cook wants a night or two off and Orgiva has a great range of restaurants and bars where you can eat out. Comments in our visitors' book describe us as the "perfect hosts" (gosh!) because we are both available and discreet. If you need help or advice during your stay we are here for you but if you want to be left alone in peace then we won't intrude. Come and stay and have a great holiday! Stylish en-suite bathroom, with a brilliant shower, toilet, wash basin, extractor fan, and a wall mounted fan heater. Comfortable and relaxing living area with sofa, dining table, chairs and CD/Radio Player. Beautiful properly equipped kitchen with granite worktop, inset hob, microwave, combi oven and grill, fridge, dishwasher, electric citrus juicer and kettle. Cooks have commented on how nice it is to find good kitchen tools in a rented apartment. Sierra Nevada Ski resort is around an hour and a half away. Motril Golf. Around 40 minutes away. There are courses around Granada around an hour away. Notes on accommodation: The Love Nest is perfect for couples and great for solo travellers. Through an archway from the sumptuous bedroom is the colourful living area, which is bathed in light from numerous windows. A deep comfy sofa, dining table, chairs and bookshelves make up the rest of the space, which has French doors leading out onto the lower terrace. At the far end is the well equipped (cook's) kitchen. Perfect for preparing Mediterranean meals from local farm produce. A cool wafting fan is available in summer, and in winter good radiators are provided. 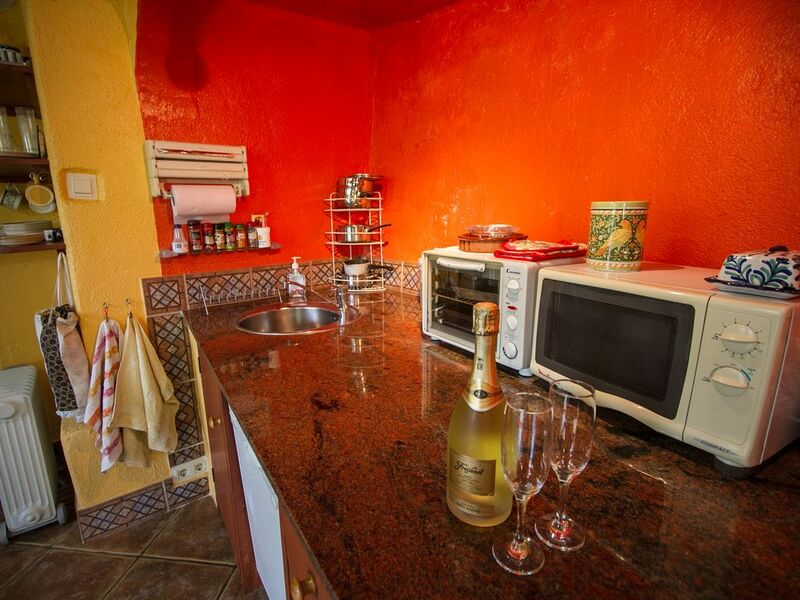 A welcome pack of basic groceries and chilled champagne are included. We aim to please, so do ask us to help with any special arrangements such as birthday flowers etc that you may have. Outside: The apartment has its own terraces and garden. There is one large paved terrace outside, partially shaded by an olive tree and festooned with plants in terracotta pots. Sun loungers, tables and a large umbrella are provided. Go up a few steps and a further vine covered patio is available, giving a secluded feel and bordered by planted banks of flowers. A BBQ area and the shady grassy garden beyond with views of farmland and mountains complete the apartment’s private grounds. Guests often comment on the range of 'lovely places to be'. A short amble down some steps takes you to the pool which is a 7 X 3.5 meter tiled "kidney Shaped" pool. The surround is fenced, grassed and equipped with loungers. Please note the pool is usually open from late May to September. Specific dates will vary depending on weather conditions. Cleaning / Towels / Linen / Maid service: All towels and bed linen will be provided and changed weekly. We ask you to bring your own beach towels. A laundry service is available at an extra charge. Thanks Lee. We are glad you had a peaceful stay. The pool was indeed cool due to an unusually late spring this year. The love nest is a lovely place to stay. The owners, Mandy and Ralph are superb hosts, and always there if you need them. Ralph is a very knowledgeable guy, and very interesting to talk to. Also recommended is horse riding, which can be arranged by Ralph. The local scenery is beautiful, and Orgiva is a bustling little town with some nice places to eat and drink. We were sad to leave! Mandy and Ralph were very welcoming, and discreet, only there if needed. The property is in a stunning location, and it was great to have a pool to cool off given the temperature! It has all you need and the location is good to visit places such as Granada, about a 50 mins drive. A cosy, comfortable apartment for two people in a peaceful location with stunning views of the mountains and countryside. Despite being attached to the owner's property the apartment is completely private and secluded. A lovely property with a gorgeous garden and fantastic views. A super stay in the quiet area near to the town with a beautiful garden. The property was great for two with everything we needed and the nearby town had nice shops, restaurants and an interesting market. A wonderful area of Spain. Just lovely: quiet, relaxing and very comfortable. We loved the place. Wendy and Ralph were helpful and unobtrusive: just there if we needed them. It was clean,well maintained and equipped with everything we could possibly have needed. We had some great food out, but also enjoyed cooking for ourselves. Would definitely recommend to friends and family. Thanks so much. Predictive text has changed my name from Mandy to Wendy!! The beaches on the Costa Tropical are 40 minutes by car. There are many to choose from within an hour’s drive and none are as crowded and busy as those on the Costa del Sol nearer Malaga. Granada airport is our nearest airport at one hours drive away. Malaga airport is 1hr 50 mins away. Car hire is available at both airports. Alternatively you can pre-book your car in the UK and pick it up on arrival. If you prefer not to drive whilst on your holiday then we can arrange a taxi to and from the airport at an extra cost. Órgiva town has a Taxi service. Please enquire at the time of booking. "White Villages" Pampaneira. The nearest - 20 minutes drive, the rest a little longer. There are a variety of things to do in the area such as walking, skiing, diving, horse-riding, paragliding, visiting traditional white mountain villages and the Alhambra palace in Granada (50 mins away). Some visitors find it difficult to leave the relaxing surroundings of the apartment and do anything at all! In this case we can arrange a soothing massage or reflexology session if you fancy pampering yourselves. Otherwise, forget everything, take another sip of wine, or gaze at the stars in the black night sky and just concentrate on being with your loved one in Andalucia! Changeover Day: Arrival days are flexible. Please arrive from 3.00pm onwards and vacate the apartment by 11.00am on the day of departure. NOTE: If we do NOT have a back to back change over then these times may be changed by arrangement.